A beautifully crafted, authentic PANDORA clip, specifically designed to keep the precious pieces of your PANDORA bracelet in place. 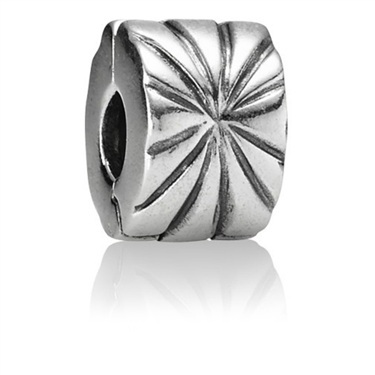 A sterling silver charm embossed with a spectacular, sunburst design adding a subtle hint of texture to your PANDORA bracelet. This piece is simple enough to be repeated in your bracelet and is the perfect addition to this PANDORA Salmon Zirconia Spindle Charm. I was delighted that Argento had held the pre VAT rise and held off on the HUUGE Pandora price increases on 4th January. With my Christmas money, I could effectively afford an extra bead that I would not have been able to get the next day at the new prices. Brilliant service, everything beautifully wrapped, thanks. Having bought this item as a christmas present, I can't comment on it personally,it is for my niece and I'm sure she will love it. I am very impressed with the service from Argento and ordered again a few days later. Lovely clip charms at good vfm. Have purchased a few charms online and the service and speed of delivery is excellent. really like these clips will definately be buying again and also recommend to friends . Bouught 2 of these clips and she loves them. Superb service as usual. Many thanks.